Re: Feasible/Reasonable to do this trip in 11 nights? Feasible/Reasonable to do this trip in 11 nights? DAY 1: Starting from deep up Lyell Canyon, cross over Donahue in the morning and stay at 1000 Island Lake. DAY 2: Dayhike to Lake Catherine in the morning, spend night at 1000 Island Lake. DAY 3: Move over to Garnet, explore and camp there. DAY 4: Move camp to Ediza, dayhike over Nydiver. Return to Ediza to camp. DAY 5: Hike over to Iceberg and stay there. DAY 7: Food reup at Devil's Postpile, head back north a few miles (once again, not sure of the campsite). DAY 8: Maybe make it up to Gem Lake area? DAY 9: Hike up Parker Pass to Mono Pass? DAY 10: Dayhike to Dana from Mono Pass, return to Mono Pass. The 11th day would be a yet to be determined exploration/rest/weather day. Then Day 12 would be just going back to the road and catching the Hikers bus back down to TM and staying in the BP campground. Let's say I'm not a super chick-on backpacker, but that I don't mind putting some miles in with an early start. At the same time, I want some time to appreciate the great scenery, as I'm not trying to have the 'kill yourself to get there' mentality of a Half Dome hiker. Does this idea sound rushed, too difficult, could it be done better. I'm ok with doing 10 miles and a couple thousand feet in a day with a pack, but I don't want to do it every day. Comments? I'd schedule this time for August so as to be able to catch the TM bus from the Mono Pass TH of course. I could also do this loop in reverse and add the previous stuff I'm doing (Young Lakes, Conness, Glen Aulin, Hoffmann, May Lake) to the end instead of the beginning, since the Mono Pass permit has some openings. Edited 4 time(s). Last edit at 06/30/2012 02:51PM by mbear. One of the earlier threads I posted really got me interested in Nydiver and Iceberg. Guess day 1 is more like 3000 feet, but I'll be trying to do that all very early in the morning. That many days... you should be able to relax quite a bit. Lots of play time imo. Anyway, I highly doubt I would stay at Gem. Not sure how much of a Gem it really is. As for the close to Reds... OD and I camped right by the top of Minaret Falls. I personally don't plan stuff like this anymore. I just have a general idea of a route.. So... what's my point? Well... it seems you've done a huge amount of legwork..
And don't forget the Twinkies! Sounds like a good way to use that 11th day then. Thanks for all the advice you have given me! What if I said I like Sno-balls better? As a side question, does anyone have suggestions on maps for this area? I don't plan on doing a whole lot cross country, so USGS 7.5 minute quads may be overkill. Plus, from photos I don't think Stevie Wonder could get lost going up North Glacier Pass to Catherine. Can't be digital or online though, as my printer isn't too great and I won't be bringing anything that could read digital maps. Edited 1 time(s). Last edit at 06/30/2012 03:56PM by mbear. It's been my experience that the USGS 7.5 maps are basically a zoom of the same detail the Natl Geo Trails Illust maps provide. There really isn't any extra detail provided, just a lot more paper to handle. The Tom Harrison Mmmoth High Country Trail Map may cover just about everything that you are planning to do. Both Thousand Island and Garnet are large lakes with many options for camp spots, yet most people will set up very close to the JMT. Hike along the north shore a ways to find a spot with more privacy. There is a fairly easy cross country route from TI to Garnet at the south-west end of TI. Ediza lake is gorgeous, but smaller and can get crowded. Consider camping at one of the Nydivers. There are three little lakes, when I was there I had them all to myself. The one time I camped at Iceberg lake I remember thinking: "there is only space for one tent at this lake, lucky no one else was here first." I find the hike from Shadow down to Reds Meadow uninspiring. Consider taking the trail down to Agnew and the shuttle to Reds for your resupply. Really liked Alger Lakes, that would be my choice for a camp spot. Yeah, the cc doesn't look too bad between TI and Garnet from what I have read, but it's very tough between Garnet and Nydiver, at least from the Garnet side, correct? D'oh, now I remember you giving me that suggestion before about taking the shuttle from Agnew, but I scrapped the Devil's Postpile idea and forgot that tip. Do you think I'd get hassled by rangers showing a Yosemite permit when coming back into Agnew Meadow from the bus? That definitely looks like an great time-saver (the $7 charge for shuttle use covers both ways?). I wonder what the prices are like at the store at Red's Meadow Resort and whether it makes sense to just buy my stove fuel there. Cross-country Garnet to Nydiver is a little tricky. However the trail to Ediza and then cross country to Nydiver is quite straight forward. From Ediza there is a pretty well worn path up along the creek, I think climbers take this route on their way to summit Ritter or Banner, anyway follow it up to a little tarn. From the tarn it's an easy half mile walk to the closest Nydiver. I don't think rangers will be hassling you for hopping on the shuttle from Agnew to Reds to pickup a resupply. Let's you skip a few dusty trail miles.Have a meal at Red's Meadow, resupply at the store, check out Devils Postpile, maybe even camp at Reds for the night. The store has regular backpacking / camping stuff, similar to the store in Tuolomne, so yes, definitely get you stove gas here, even if there probably is a dollar or so markup. I have seen some people rate it as pretty easy from that side, while from the Garnet side it was pretty tough. I ask because it looks like there's a pretty amazing view of Garnet from that pass. Do you agree, or is it pretty rough on either side. I wouldn't be taking a pack up it, though I'll consider taking one up to Nydiver since the shortcut to Red's Meadow Resort looks like it should save a decent amount of time. Sorry, I don't know. When I went from Garnet to Nydiver I didn't know about White Bark Pass. Instead I just made it up as I went along, going farther to the east and then back, making it a longer but less steep route. No prob. Thanks for your your great suggestions, as I probably wouldn't have planned the Nydiver Lakes nor Iceberg/Cecile without your suggestions in my earlier thread months ago. Anyone ever sent themselves a package at the Mammoth Lakes post office? Since there's public transportation into town, maybe that'd also be a convenient way to go with food re-ups. Especially since I wouldn't be hiking down to Red's Meadow anyways. Curious why you wouldn't send the resupply to the Reds Meadow Store. They don't charge as much in reality as they do on paper... we were going to do that until the trip plan changed. I just called the Mammoth Lakes post office and they told me they'd hold my food reup for 30 days for no extra charge, so I don't see any reason to pay the $35 + $1 per day at Red's. Especially when I'd like to go grab some food and a beer in town without being charged really high prices (I read a claim from someone who said a burger/shake/and some chips cost him $19 at Red's Meadow Resort! Accurate?). I wouldn't mind paying the cost if I actually planned to hike to Devil's Postpile, but here and in another thread I posted a few months ago the general consensus was that hike wasn't worth the time and effort relative to the rest of the area. My thought was, the farther off the trail I got, the more likely it would be that I would succumb to the lure of all the great places to eat in Mammoth, and the hotels, and then I would be exceeding the 24 hour max off trail and need another wilderness permit... technically speaking. No idea how they would monitor that. But, $35 plus about five bucks for storage in Reds vs. hotel, food, etc in Mammoth... still cheaper. I'm a cheapskate. I'd rather spend the money on gear. mbear >>>"..Does this idea sound rushed"
Your itinerary includes several areas experienced backpackers would divide up into several trips. There has always been a mindset with some going way back to Sierra Club Outing days to create elaborate itineraries including as many publicly well known and highly regarded spots as they could. Resulting in a lot of long mileage mid morning to late afternoon trail pounding marathons. Often from one famous lake to another. Of course to novices and especially those who live in parts of the country far from our mountains, such itineraries often met with glowing excitement and challenge. I recall years ago base camping in Dusy Basin whereupon a large Sierra Club Outing group came in about 6pm one afternoon after having climbed up from some place like Grouse Meadow on the Middle Fork far far below. The next day they were getting up and heading east over Bishop Pass and out. Oh they got to see Dusy Basin from their camp, an hour or so late in the day, too beat to explore anywhere, and then were expected to beat it on out 6 miles the next morning. Such magnificent places simply deserve more time, otherwise a person is hardly experiencing anything more than horse turd dust floating up from their boots on trails. And that is particularly the case with the Ritter Range. Simply meander further east along the shores above Garnet then angle up east of point 3267. At the pond at top be sure to take a break and dip like we did. Then angle down to the southwest and then either follow the Nydiver outlet stream up or head for Ediza. Oh and lakeside camping at Ediza is both limited by no camping zones and what is there one will find mediocre. Even worse at Iceberg Lake. Far better to head southwest at least 150 feet higher in the basin into areas of mountain hemlock and turfy flowery meadows. Edited 4 time(s). Last edit at 07/01/2012 11:38AM by DavidSenesac. Thank you, David, for the comments. Where do you see the biggest mistakes in my itinerary? When I put this together I thought I was being pretty careful to keep it from being a constant slog of long days without time for exploration and enjoying the areas I got to. OK, I know this one is a real slog to gain the 2000 feet up to Donahue Pass, but I should be camping pretty deeply up the canyon the night before so I can do this gain as early as possible. I'd do a 6AM start to keep from having to gain most of the elevation in the hot part of the day. This day does seem somewhat tough, but 3 days worth of hiking to get from TM to cross over Donahue seems like a bit much to me (the first day that doesn't count towards the 11 I have proposed would be to get up the flat part of the canyon). I know I could spend some time exploring, especially up to Lyell Glacier, but the area around Ritter is more important to me and I think I'll have to cut side trips from this area out. Would you break it up with camping somewhere between Donahue and 1000 Island? Isn't that about 8-9 miles or so and 2000 gain/1200 foot loss from the end of Lyell Canyon to Donahue to 1000 Island (didn't measure this one carefully). I would probably setup camp somewhere up a ways towards the northwestern shore, and then dayhike over to Catherine. It looks like a really rough 3.5 miles or so roundtrip from my USGS topo map (using a string to approximate my path and then measuring the string against the mileage scale). I don't see any easier way to see Catherine though. Campsites are supposed to be pretty hard to come by there and doing that kind of terrain I'd much rather not have a pack on my back. Catherine is the place I'm looking forward most to seeing, so no way I'm eliminating it. Using the same measurement method and the same USGS 7.5'' quad, it's a little more than 3 miles of mostly on-trail hiking without a lot of elevation gain to get from the NW end of Thousand Island to the NE end of Garnet. Not exactly sure where I'd camp at Garnet, but it seems like I should have plenty of time for exploring Garnet with the 6:00-6:30 start I usually like to make when backpacking or dayhiking. Hmmm... so Ediza is bad. I think I might then update these days to camping at Nydiver to have some time to explore there on DAY 4, and then setting up camp SW of Ediza DAY 5 and exploring around there and over to Iceberg. That would give me about 3.2 miles on trail b/w the NE end of Garnet to the turnoff to Nydiver, followed by a steep 3/4 mile use-trail/off-trail to get up into Nydiver. Looks like maybe 1.2 miles or so from the bottom of that Nydiver turnoff to Ediza, and then about a 2.5 mile roundtrip dayhike to Iceberg with about 550 feet elevation change each direction. An extra half mile and another 400-500 feet if I want to take the steep trail up to Cecile too. Looks like about 5.5 miles to get to the road at Agnew Meadows on DAY 6 from around Ediza going on the trail that goes across the northern end of Shadow Lake. What's the closest legal site to camp at so I can get into Mammoth Lakes in the morning for a food reup? I know I can take the Red's Meadow Shuttle from the road there and take it up to Mammoth, then take one of the bus lines to the post office. I would do this instead of hiking to / taking the shuttle to Red's Meadow Resort for the re-up (that way I could go stuff myself at Carl's Jr in town for a break from all the pastaroni, nuts, power bars, etc. I have for eating on trail). I would do the in-town visit on DAY 7. Maybe on DAY 6 spend the early hours exploring more around Ediza and then later on camp somewhere just before or just after Shadow? Where would be good to camp DAY7, assuming I'd like the take the PCT exit from Agnew after the reup? Is it better if I add one more day for the return leg of the trip? I don't plan to fish and I'm not likely to swim much either, so what I want to do in my time is mostly take in sites and just explore a bit off trail when I get to some of the destinations like Catherine, Ediza, Nydiver, Garnet, etc. Do you feel like 1000 Island needs more time? Those first 6 days don't look too long except for DAY 1 (I really want to camp at Thousand Island on DAY 2 to see a sunrise off Banner though). I realize I'm skipping great areas like the Marie Lakes, but that gives me something to come see next time. And 3-5 miles a day on trail without crazy elevation gain and at around 10,000 feet doesn't seem too crazy (haven't felt like it was long mileage hiking before at that kind of altitude). You think this might be a better option than taking the trail around 1000 Island and around Garnet with a pack? Is it ever any worse than some class 2? Also, where would you consider the best camping at Garnet to be? Thanks again for your help. Edited 3 time(s). Last edit at 07/01/2012 03:42PM by mbear. Your route makes sense for someone doing PCT trail sections in both directions. Essentially attractions of your trip reads of a focus about the central Ritter Range. Your iternary includes a long approach from Tuolumne Meadows where it just reads like a pass thru and later a long inefficient drop down into Devils Postpile to resupply and then climb back up reversing direction as a less interesting loop to get back to your vehicle. The way most backpackers efficiently access the Ritter Range is from Agnew Meadows as a loop ending back at AM or Devils Postpile. And then a bus ride back to AM or the Mammoth staging area. You could then drive to Tulomune Meadows for a second trip. However a better idea would be an 8 or 9 day trip just in the Ritter Range experiencing it the way it ought to be and simply visiting Lyle or Dana Fork areas efficiently on other trips. Like many well known areas of the High Sierra, there really are a lot more places worth spending time at along the Ritter Range than are publicly known. And many fine peaks and points to climb or day hike to. From AM I would suggest hiking the PCT to Summit Lake. Then spend the next morning climbing up through the colorful volcanic geology with rolling pummice balls to the top of the plateau around topo Point 3188. Of course you've never heard of that being of interest. Trust me far more wonders are unknown than known. Then move on to Thousand Island Lake and spend at least one day about the eastern shores as well as nearby Emerald and Ruby Lakes. Why because when people speak of its World Class views it is because of the early morning views from that end and the flowery stream areas below. A place to savour slowly. Then spend a day at the other end where you can explore areas noted in your post and generally continue on the plan you presented. Edited 5 time(s). Last edit at 07/01/2012 04:38PM by DavidSenesac. From AM I would suggest hiking the PCT to Summit Lake. Then spend the next morning climbing up through the colorful volcanic geology with rolling pummice balls to the top of the plateau around topo Point 3188. Of course you've never heard of that being of interest. That plateau sounds pretty interesting. What's the easiest way up it and is it class 2 or is it tougher? Also, is there any reasonable camping between Summit Lake and Agnew Meadow on the PCT to make the food reup day easier, since it will require some time in town and maybe a stop for a beer too. The food re-up is an absolute must since I can't carry more than 6 days of food + a couple of extra snacks in my Garcia; I need some space for lots of sunblock and some camp soap. Don't laugh at the soap haha, I need it to keep my nose clean to put Breathe Right strips on, as they always make hiking at altitude a lot more enjoyable for me. Edited 4 time(s). Last edit at 07/01/2012 07:38PM by mbear. After crossing Donahue and about 4 miles later Island Pass, leave the JMT/PCT and head due south, following the drainage, to the west end of Thousand Island. Its very gentle and open cross country, it gets you away from the people on the trail, sets you up at some really nice campsites at the west end of Thousand Island, and gets you closer to Catherine for the next day. This route was one of the first times I "stepped off the trail" many years ago and I have been hooked on the cross country ever since. Be sure to be up at sunrise the next morning...if it is still and the water glassy, there is not much better than sunrise as seen from the west side of Thousand Islands Lake! Again, strongly consider staying on the west side and going cross country to Garnet, staying on the west side. Nice cross country and shorter! Same...stay on the west side, pass by Nydiver on your way to Ediza. When you get to Nydiver, you will actually want to head just south of due west to near the base of the Ritter glacier, and then follow the drainage down to Ediza. There is a use trail there you might be able to pick up on your way down to Ediza. I would guess that from Iceberg you might be tempted to head south to Minaret Lake and then down to Devil's Postpile. This is doable, but there is a very short section of class 3 rock between Cecile and Minaret Lake that will need attention and which you may or may not want to do...Roper describes it well in his book. Hope that helps (or at least doesn't confuse too much!) Have fun, be safe! I have heard Roper is kind of a lunatic on what he considers easy. I remember watching some youtube videos of stuff he considered easy and even the people doing the SHR were shocked. Whitebark Pass from Garnet sounds like too much with a pack for me. I might look at the cc route DaveSenesac recommended earlier though. The main reason I wanted to camp out there was I was thinking of going up the West slope of Ritter, and there are some posts (on summitpost I think) that detail one place where you could find camping. Classic case of 'hey, these long and grueling days sound great' when first looking at the map and reading a couple of trip reports and then coming to my senses as the trip gets closer, haha. I think I'll save Ritter for a time I can do it with some friends so I don't get in huge trouble if I turn an ankle or something on the rarely traveled west face. Class 3 gives me pause going solo in an area so deserted (there aren't too many people who actually do SHR, correct? ), though I might consider it in that case since I wouldn't be carrying a pack. If I feel like I have the time and I'm 100% sure I can get down an up safely when looking at a route, then Minaret could be a possibility in some of my exploring time from the Ediza area. Not counting on it though, as a wise bird told me "You can't win! "; e.g. you can't see everything, haha. Edited 2 time(s). Last edit at 07/01/2012 11:16PM by mbear. Cecile Lake is pretty nice. There's one cool campsite cleared in the talus east of the lake and more up on the ridge above. Cecil Lake is great. I thought that Minaret Lake to Cecil was class 2. It was pretty easy. I thought that Iceberg Lake to Cecil was more difficult, but snow was a little heavy when I was there. Great views from both ends of Cecil Lake. Also great views down to Minaret Lake from a little bit above the east end of Cecil. It's all great in this section of Yosemite's backyard. Edited 1 time(s). Last edit at 07/09/2012 11:24AM by yosemitejim. If it's snowy maybe I'll just take the long way to Minaret through DP. Since I have 14 days b/w the Parker entrance and Lyell exit I should have lots of flexibility to add that if need be (really don't want to deal with any kind of summer slick compacted sun-cupped snow). I've seen it spelled Cecil Lake a lot of places, but I've also found it spelled Cecile. Another question: what do you guys think of the hike up Koip and Kuna Peaks from Koip Pass? A worthy sidetrip, or something worth skipping for more time in the Ritter area? I've seen several references in this thread to Whitebark Pass but can not find it on any map of this area. All I see are Ritter Pass and North Glacier Pass. Where precisely is Whitebark Pass? It's another 100 degree day today and I'm hiding inside instead of training for my upcoming trip, so I thought I'd do some armchair exploring and see if I could find Whitebark Pass. I couldn't find it labeled on a map either. 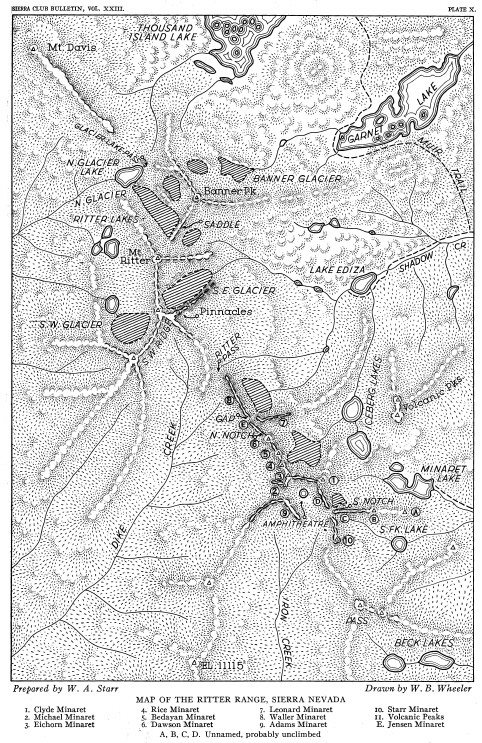 Based on pictures in trip reports I found on other sites like this one, I think Whitebark is in the center of this map. Edited 2 time(s). Last edit at 07/07/2012 02:08PM by mbear. O.K., from now on I'm going to start making up names for geographical locations in Yosemite and make y'all ask why you never heard of them! I bet it's only named since it's a class 3 pass on the Sierra High Route. I'm going to assign names to every Class 1 feature I can find and refer to them randomly. Working on a list now. Since astonomy is my hobby perhaps star names will work. How about Zubeneschamali Pass, Denebola Crest, and Lake Deneb Kaitos? Chick-on thinks Table Lake is the most beautiful place on the planet. He's never seen Deneb Kaitos! Then again, maybe he has; he just didn't know what it was called. Will you be renaming this lake? 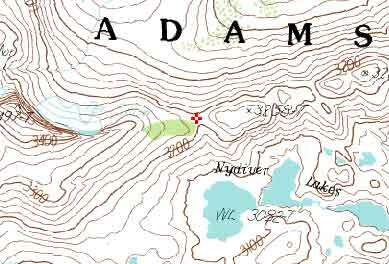 Do not even think about backtracking from Iceberg or Cecile to Shadow Lake to pick up the JMT and head to Reds Meadow. Edited 1 time(s). Last edit at 07/08/2012 05:21PM by h_lankford. Yeah, it doesn't look too bad in QINTL's video posted above. I'm betting on the snow being melted out; otherwise, I'll pass (this bear's allergic to hiking on snow, unless it's winter time and the stuff is fresh!). Edited 1 time(s). Last edit at 07/08/2012 07:46PM by mbear. That video (thanks- I overlooked it) must be of the route ascending from Minaret to Cecile. Notice he moves well without much of what would seem class 3 activity. I hardly recognize it from that way. I (and you if you go) had it the other direction. It looked less threatening going Cecile toward Minaret, in part because you look down and see what you were getting into. I just found out the Agnew Meadows Campground is closed for the entire summer, so I'm guessing the shuttle won't stop there and I'll need to hike down to Red's instead for the food reup. From there I think I'll just take the Minaret Lake trail, and then do the SHR climb to Cecile (I'd much rather do that crosscountry uphill anyways). Hopefully that snowfield won't be there b/w Cecile and Iceberg, as I'd likely turn around and take the long route in that case if it's anything like what I have experienced of hiking on late summer snow before. I'll definitely carry a copy of your route description with me for the trip b/w Minaret and Cecile. Thanks. Edited 1 time(s). Last edit at 07/12/2012 10:36PM by mbear. It's a major trailhead. I'd be very surprised if the shuttle didn't stop there. I'll call them tomorrow and post what they say. You're right; I just called the Inyo NF and they said the trailhead is open and the shuttle is making stops there. Only the campground is closed. No renaming; just places on the maps with no name. Besides, I would never touch anything that said "chicken". I'll quit talking about this for now. Don't want to totally corrupt this thread since it's a really good one.